Modern elements mix seamlessly with old architecture in this tranquil hideaway on the Cadiz coast. Once a XVI century casa-palacio, it was reborn as a luxury 12-bedroom boutique hotel in 2008. 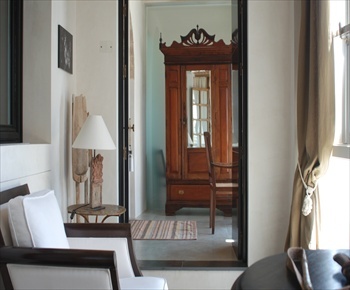 Intimate, exclusive interiors, serene whitewashed walls, teak and rosewood floors, Portuguese antiques, avant-garde designer bathrooms and extra-long beds are just some of the features of this luxury boutique hotel. The entire hotel can be rented as a fully-staffed private residence with five-star service for private events or special occasions. Reception 08:00-12:00 and 16:30-20:30 in low season, 08:00-23:00 in high season, 24/24 by phone. Languages spoken English, Spanish, French and Dutch. Lounge, patio with trees and vines. Rooftop terrace with great views over the old town, surrounding countryside and the African coast is a favourite haunt of hotel guests. National/international press delivered to guest room on request/availability. WiFi internet connection available throughout hotel, internet use gratis; PC available for use of guests gratis on request; use of cell phone on request. Safety deposit box at reception. Laundry, pressing and dry-cleaning service available except weekends and bank holidays, 24-hr. express service available. Iron and ironing-board available on request. Babysitting on request. Doctor on call 24 hours in case of emergency. The hotel offers 12 individually-decorated double rooms leading off a central patio, 5 Classic Rooms, 6 Superior Rooms and 1 Exclusive Room with a private terrace. All rooms are quiet, and have individual air conditioning, underfloor heating, in-room telephone, satellite and cable flat-screen TV with radio, DVD, complimentary wireless internet, and at least one window that opens. The rooms are open-plan and individually decorated, featuring antique tables and cupboards and heavy chenille curtains. The twin, queen- or king-size beds have 100% Egyptian cotton bed linen. Ensuite bathrooms are designed for maximum comfort and equipped either with baths and showers over the tub or with walk-in rain showers; Kama Ayurveda toilet articles, dressing-gowns, slippers and hairdryers for the use of clients during their stay; some bathrooms are discreetly concealed behind glass partitions, and some bathrooms also have bidets. Evening turndown service. Courtesy gift on arrival. Communicating rooms available, either via a connecting door or with a private hall. Ground-floor room for guests with limited mobility opens onto private patio shaded by an olive tree. All rooms are non-smoking. All the rooms have high ceilings or roof beams and feature antique tables and cupboards. Charming rooms with plenty of natural light; some Superior Rooms have a small private garden, sitting-room or terrace. Personal bar with an interesting selection of Spanish wines from small bodegas and bottled water from remote parts of the world. Bedroom and sitting-room with a private terrace, from which there is a stunning view. Personal bar with an interesting selection of Spanish wines from small bodegas and bottled water from remote parts of the world. King-size bed. Superior Suite comprises one Superior Room and the Exclusive Room with a sitting-room and a private terrace with a stunning view. Both rooms have king-size beds. Mineral water in your room per night of your stay. Welcome drink at check-in. Complimentary room upgrade at check-in (subject to availability). Child under 2, gratis; cot provided, also gratis. Extra beds are not permitted in the rooms. Breakfast is not included in the room rate, 9.50 EURO extra for breakfast. 8% VAT is not included in the room rate. Singles, couples, fully-staffed private residence for groups. Guests looking for a typical commercial hotel experience. Check-in: 17:00-20:30; check-out: by 12:00. Guests planning to arrive after 20:30 are requested to advise their time of arrival on booking. Late check-out available before 15:00 at a supplementary charge of 60 euros per room. Visa, MasterCard. The hotel does not accept or exchange foreign currency. On reservation, a deposit based on 50% of the total amount of stay will be charged to the client´s credit card to guarantee the booking fee. BREAKFAST: served 08:30-11:30 in your room, in the reading room, in the XVII century garden patio or on the roof terrace. LUNCH: Not served. DINNER: Dinner is only available upon request. ROOF TERRACE BAR: A perfect place to unwind with a glass of fino sherry or champagne. Full honour bar; closed 23:00. LOUNGE: The lounge has an honour bar with an interesting selection of Spanish wines; no opening hours apply. ROOM SERVICE: Room service is available during reception opening hours. EXCLUSIVE RESIDENCE: A wonderful alternative to the usual hotel experience, this beautiful hotel is a discreet location for guests who prefer privacy in the comfort of a home away from home, and may be rented as a fully-staffed private residence complete with five-star service. Ideal alternative for weddings and all special occasions. The exclusive residence offer includes accommodation for 24 persons for two nights, services of all staff during your stay, breakfast for 24 persons, evening turndown service and late check-out. IN THE HOTEL: LOVELY ROOFTOP TERRACE with sunbathing deck and lounge chairs, infinity water fountain with wading pool below, and Jacuzzi (which is available until 22:00). Panoramic view over the rooftops and battlements of Vejer and the Andalusian countryside. OUTSIDE THE HOTEL: WATERSPORTS: Surfing at the long, white sand beaches of Los Caños de Meca, unspoiled El Palmar, Zahora and Tarifa. GOLF: Montenmedio Golf and Country Club, Fairplay Golf Course in Benalup. RIDING and POLO: Ask at reception about polo training sessions for beginners and advanced players. HUNTING: Big game and red-legged partridge in season. MASSAGE TREATMENTS: The ancient water well of the house has been made over, given an airy spiral staircase to the ground floor, and delightfully adapted for use as an Ayurvedic massage room. This Hindu technique uses a series of massages to balance body and mind; price from 120 euros for a full-body treatment. Massage menu, more details and appointments at reception. HAIRDRESSER: Private salon services in your room on request and by appointment. Ask at reception. No smoking in the rooms and closed public areas; smoking is permitted in open air areas like the patio and roof terrace. As guests prefer, generally smart casual or casual. Jerez airport 77 km/40 min, Seville airport 165 km/1 hr 43 min, Gibraltar airport 90 km/1 hr 40 min. If you are flying from Gibraltar, allow 1 hr more to compensate for possible traffic holdups. Estación de Cádiz, 56 km/47 min. 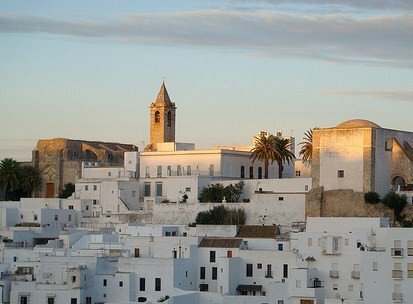 Vejer de la Frontera is 10 km inland from the beaches of the Costa de la Luz, 57 km south of Cadiz. Shops, bars and restaurants are within a short walk of the hotel. OLD TOWN: The hotel is in the middle of the old town of Vejer de la Frontera, which was settled in the VIII century and is classified as a World Heritage Monument. Magnificent XIV century church of El Divino Salvador 50m from the hotel; castle of the same date. White-painted houses line the winding cobbled streets; museums and archaeological sites reveal over 3,000 years of history. Lots of photo opportunities. PRIVATE LIMOUSINE: Chauffeur-driven transport is available to/from the airport on request. Approximate cost of transfer from nearest airport, Jerez de la Frontera, 100 euros. Cars and bicycles may be rented through the hotel. PARKING: Hotel has no car park. Guests are requested to park in one of the town car parks and advise the hotel of their arrival; guests and their luggage will be collected by a driver with a buggy and taken up to the hotel. The nearest car park is Parque Los Remedios at the entrance of the village, an 8-min. walk from the hotel. ROMAN RUINS: Baelo Claudia in Bolonia. BOAT TRIPS: from Tarifa to Morocco for the day, or whale and dolphin watching excursions near Gibraltar. NATURE: The natural parks and Atlantic beaches near Vejer are great for birdwatching, paragliding and walking and cycling tours. WINETASTING: The hotel organises winetastings and visits to local bodegas. Ask at reception. Please remember to let your concierge team member know about your personal preferences, whether it is a type of pillow you prefer, your favourite drink in your room or need interconnecting rooms for your children please let us know so that we can request this for you. If you need either a self drive or chauffeur driven car or would like an airport pick up we will be pleased to arrange this for you as part of the service, please let your concierge team member know. If you are celebrating a special occasion and you would like to plan a surprise we can help you. Let us know the occasion and an idea of what you would like and we will work with you to ensure you have an unforgettable experience. Do you have any special needs or requests for this stay?